Awesome Toast! | SparkPost: Dynamic subject lines in email templates SparkPost: Dynamic subject lines in email templates – Awesome Toast! 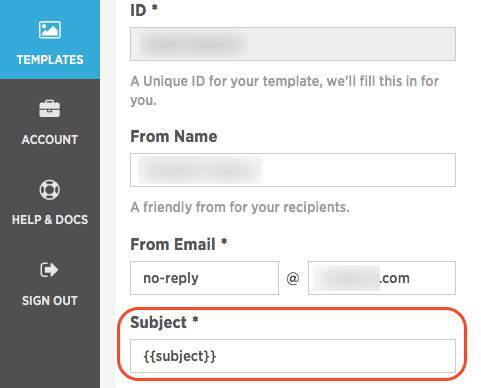 In Mandrill (and possibly other transactional email services) we can use the API to send emails using templates. We send a bunch of information including recipients, content, metadata, and subject, ad we let ‘er fly. Boom, done. Worse, at the time of this writing anyway, there’s no clear way to fix it. It isn’t specifically covered in the documentation, and the support center answers (such as this one) are… not ideally helpful, we’ll say that. "main_email_body": "This message is to transactionally confirm that your sign is 'Quagmire' (we didn't know that was a thing) and your favorite color is 'blue'." "subject": "We're sending this email to blue-loving Quagmires"
Yep. You can put variables in there. Currently this is the official recommendation: https://developers.sparkpost.com/faqs/dynamic_template_subject.html.